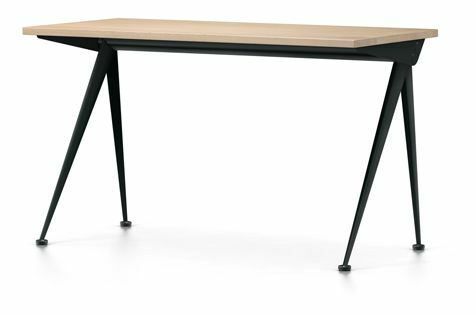 The slender, elegantly splayed metal legs of the Compas Direction desk by Jean Prouvé call to mind the hinged arms of a compass – ‘le compas’ in French. Their design is based on engineering principles that typify the structural approach of the French designer and engineer. Paired with the oiled solid wood table tops, they form a richly contrasting mix of materials in the home office. Bent sheet steel, powder-coated finish (smooth).